Background: Sexually transmitted infections (STIs) promote Human immunodeficiency virus (HIV) transmission by augmenting HIV infectiousness and susceptibility. In our society, especially in rural areas, males are common visitors to STI clinic than females who are generally traced as a contact. This difference may be due to the asymptomatic nature of infections in females, lower awareness among women of need for availing medical facilities, or their frequent consultation in gynecological clinics instead of STI clinics. Aim: To determine the prevalence, clinical profile, and the pattern of STIs in males and the prevalence of HIV infection in them at a rural-based tertiary care center. Materials and Methods: A retrospective study of male cases attending STI clinic between January 2008 and December 2009 was carried out. Diseases were diagnosed on the basis of clinical morphology of the lesion, and HIV and Venereal disease research laboratory (VDRL) testing was done in all cases. Results: Of 23 433 male patients presenting at the Skin/VD department, 201 were diagnosed to have STI. 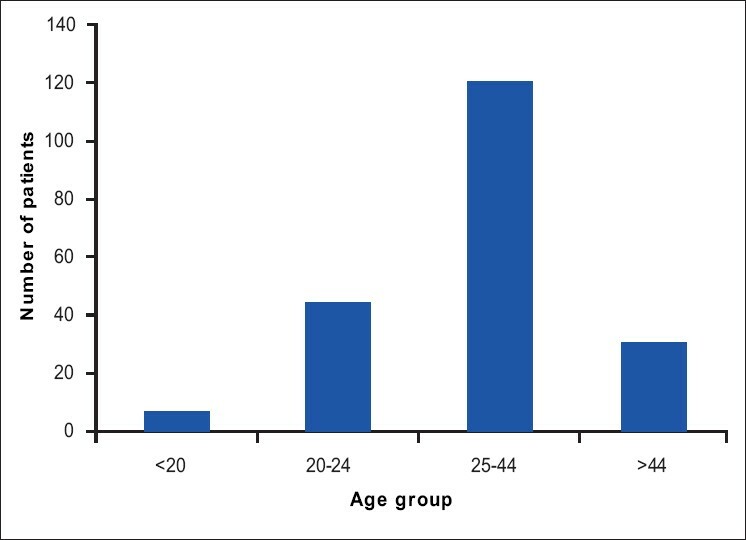 Most common age group affected was 25 to 44 years (59.7%). Incidence of STI was high among married individuals (77.2%). Herpes genitalis was most common STI in 49 (24.37%) cases. Viral infections (herpes genitalis, genital warts, and molluscum contagiosum) accounted for 62.2% of cases. Prevalence of HIV in STI was 2.48%. Conclusions: The persistent and recurrent nature of viral infections is responsible for their increasing trend in the current STI scenario. HIV and STIs are perfect examples of epidemiologic synergy as they are core transmitters of each other. STI being higher in married individuals further underlines the importance of contact tracing, counseling, and prompt management of the partners. Objectives: The present study was undertaken to determine the prevalence of respiratory, gastrointestinal and other pathogens in 100 Human Immunodeficiency Virus (HIV) seropositive patients. Settings: This study was carried out on randomly selected 100 HIV seropositive patients from S. S. G. Hospital during the period from Jan 2006 to Jan 2007. Materials and Methods: Sputum samples, stool samples and oral swabs were collected from all the patients and cerebrospinal fluid (CSF) was collected from symptomatic patients and processed as per the standard protocol. Sputum samples were examined by microscopy and cultured for bacterial respiratory pathogens. Stool samples were concentrated and examined by microscopy for enteric parasites. Oral swabs and CSF were also examined microscopically and cultured for fungal pathogens. CSF was also examined for bacterial pathogens. Results: A total of 101 pathogens were detected in 60 patients. More than one pathogen was observed in 30 patients. Candida was the commonest isolate (32.67%), followed by Mycobacterium tuberculosis (22.71%) and Cryptosporidium parvum (19.8%). Conclusions: Since opportunistic infections are a major cause of mortality and morbidity in HIV seropositive patients, an early diagnosis and effective treatment are required to tackle them. The type of pathogens infecting HIV patients varies from region to region, and therefore such patients should be constantly screened for these pathogens. Background: Some individuals experience a discordant response during antiretroviral therapy (ART), with a blunted CD4+ cell count response despite low HIV-1 RNA plasma levels. Materials and Methods: CD4 counts and viral load of 251 individuals on ART referred to the center were analysed for immunological failure. The viral load tests of 28 patients revealed a discordant response, characterized by low CD4 counts despite viral suppression (<47 copies in 23, <5000 in 4 patients and <10000 in one patient). Univariate and multiple regression analysis was done to determine factors associated with immunological failure in patients with viral suppression. Results: Twenty-eight patients developed immunological failure over a duration of 3.7±1.14 years despite viral suppression. In univariate analysis of discordant patients, low CD4 counts(<100cells/μl) at start of ART(P=0.0261), less than 50% gain in CD4 count (P=0.048) after one year of start of ART and duration on ART for more than 3 years (P=0.0436) were associated with immunological failure. In multiple regression, duration on ART, age and nadir CD4 count (lowest ever) on treatment were predictors of immunological failure in these patients. Overall females (n=8) demonstrated much higher CD4 counts of 136±72 than males (n=20) 79±38 cells/μl at the time of diagnosis of immunological failure. Conclusions: Discordance was observed in 13.59% of patients. Detection of failure to first line therapy based on immunologic criteria, without viral load testing, can result in unnecessary switches to 2 nd line therapy. Introduction: Diagnosis of HIV infection in infants is difficult due to the presence of maternal antibodies; only nucleic acid assays are very helpful in early detection. Filter papers are especially useful for blood collection in resource-poor settings with limited access to diagnostic facilities. Materials & Methods: DBS samples were collected from the infants born to HIV seropositive mothers who had received single dose nevirapine at onset of labor. The samples were directly spotted onto the Whatman 903 cards from heel, big toe or finger prick depending on the age of the infants. A total of 766 infant samples were collected on dried blood spots (DBS) and transported to the Department of Experimental Medicine (DEM), Chennai, for testing from different government hospitals of rural and urban parts of Tamil Nadu, South India. According to National AIDS Control Organization's (NACO) protocol DNA was extracted from all these DBS and PCR was performed using the Roche kit version 1.5. Results: Fifteen infants were found to be HIV positive and 751 were HIV negative; all these 15 positive infants and 49 negative infants who were in the age group between 10 and 18 months were repeated with another DBS and compared with whole blood. The DBS results were concordant with the whole blood method and the sensitivity and specificity were 100%. Objectives: The presence of STD facilitates shedding of HIV and increases HIV-1 disease progression, possibly by increasing plasma viremia. Our aim was to study the presence of various associated Sexually transmitted disease/Reproductory tract infections in HIV-seropositive women in India. Materials and Methods: The study included 40 HIV-seropositive women attending the antiretroviral therapy (ART) clinic at Lok Nayak Hospital. An informed consent was taken from all subjects. All cases were subjected to detailed gynecological examination and two types of swabs, i.e., a vaginal swab and a cervical swab were taken for STD/RTIs evaluation. The vaginal swabs were used for preparation of wet mount and KOH mount for diagnosis of trichomoniasis and candidiasis; to make a vaginal smear for Gram staining to diagnose bacterial vaginosis (BV) as per Nugent's criteria; for culture of aerobic bacteria and Candida spp. The cervical swab was used for isolation of Neisseria gonorrhoeae by culture and for detection of Chlamydia trachomatis antigen by Chlamydia microplate enzyme immunoassay kit (BIORAD). All data were analyzed using appropriate statistical tests. Results: All 40 cases were evaluated for the presence of STD/RTIs associated with HIV infection. The women belonged to the reproductive age group (15-45 years) and majority (40%) of them were para 2. Most of the women (14 , 35%) were in World Health Organization (WHO) stage I and maximum number (28, 70%) had their CD4 cell count more than 200 cells/ml. 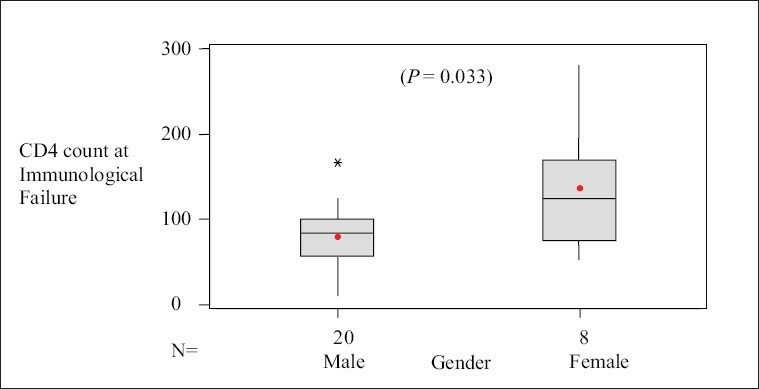 There was no significant correlation between WHO stage of HIV-seropositive women and their CD4 cell count (P=0.092). Out of 40 cases, 15 (37.5%) were on ART with maximum cases (53.3%) in WHO stage III. The duration of ART was more than 6 months in 9 (60%) cases. The most common presenting complaint was vaginal discharge in women with WHO stage II and III and 27.5% women showed vaginitis on per speculum examination. Laboratory tests showed high prevalence of BV (30%), mixed infection (30%), and candidiasis (10%) among HIV-seropositive women (P<0.001 in both). Women with BV were mostly in WHO stage I (38.4%) and stage II (36.3%), while those with mixed infection were mainly in WHO stage III (36.3%) and stage IV (40%).Women with candidiasis were mainly in WHO stage III. C. trachomatis antigen was found only in one subject (prevalence 2.5%). Both WHO stage and CD4 cell count had no significant correlation with presence of BV (P=0.056 and 0.063, respectively) and candidiasis (P=0.492 and 0.530, respectively). 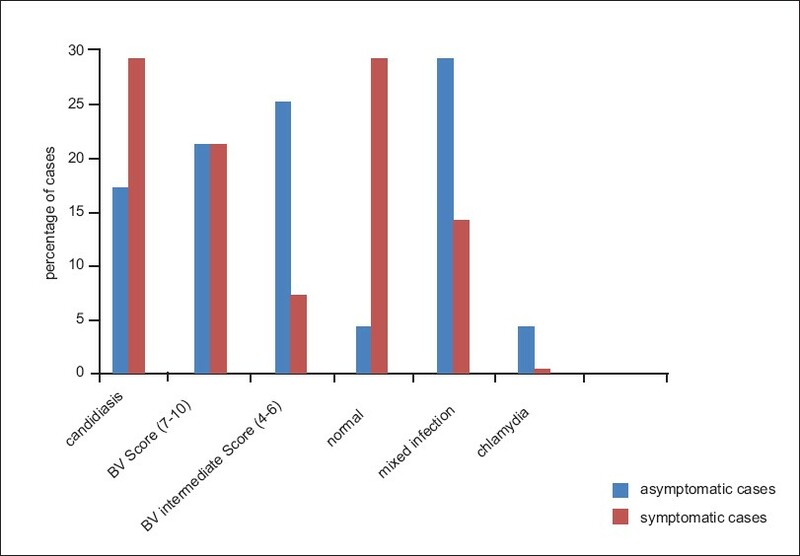 Maximum number of patients on ART had mixed infection (53.3%), while most of the patients (36%) not on ART had BV. There was no significant association between duration of ART and the presence of vaginal infections. Conclusions: The prevalence of gynecological symptoms and RTIs in HIV-seropositive women is high enough to warrant routine gynecologic evaluation and RTI screening in these patients. However, larger studies and trials are needed to evaluate the effects of ART on these abnormalities as well as to choose the best screening tool in HIV-seropositive women. Kaposi's sarcoma is a multi-focal vascular tumor involving skin and the other organs. HIV associated Kaposi's sarcoma is one of the AIDS defining condition. It is rarely reported from India. 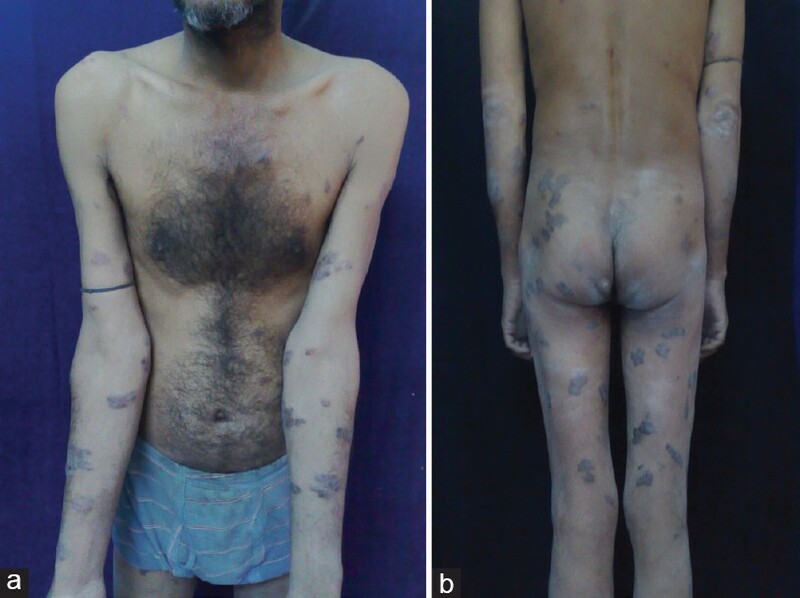 We report a 40-year-old heterosexual married male with widespread cutaneous lesions of Kaposi's sarcoma without any oral lesions or systemic association as a presenting manifestation of HIV. HIV-associated nephropathy (HIVAN) has been reported in HIV-infected adults. HIVAN in children has not been described previously from the Indian subcontinent though we had reported earlier about non-nephrotic range proteinuria in HIV-infected children and their response to antiretroviral therapy (ART). We now report two children with HIV and nephrotic range proteinuria who demonstrated proliferative glomerulonephritis and mesangial hyperplasia, respectively. Pyoderma gangrenosum(PG) is a rare ulcerating inflammatory neutrophilic dermatosis. Genital involvement has been rarely reported. 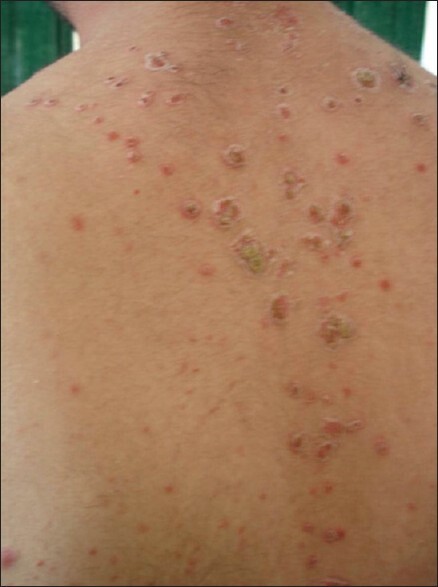 We report such a case of 24- year- old, male patient living with HIV/AIDS(PLHIV) who presented with progressive genital ulceration, not responding to oral antibiotics and aciclovir, gradually increasing in size over 15-18 months. Repeated biopsies showed acute on chronic inflammation. The lesion partially responded to oral and topical corticosteroids but soon increased in size after tapering the dosage of the steroids.Then patient was given Imiquimod 5% cream to be applied over the lesion once daily for 2-4 weeks. Lesion cleared completely in 4 weeks and is in remission since last 6 months. The case report highlights the successful use of topical Imiquimod 5% cream in the treatment of penile PG. Mucocutaneous manifestations can be the first markers of HIV. 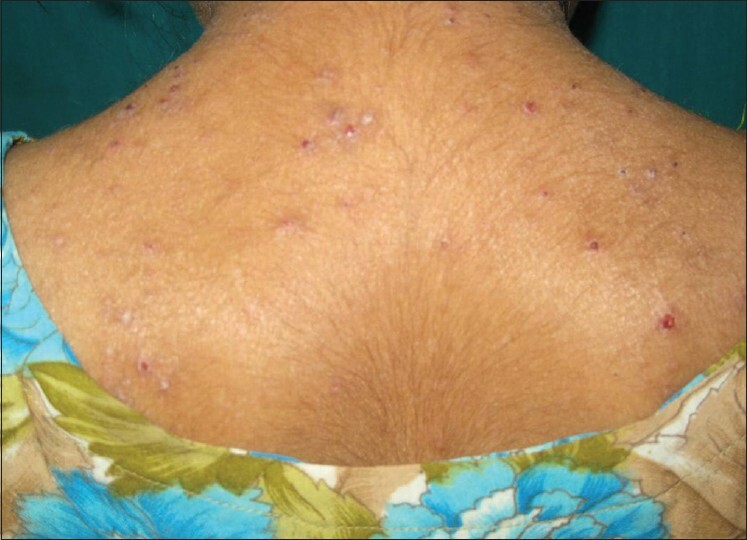 We are reporting the case of an adolescent girl who presented with chronic, recurrent, intensely pruritic papular lichenified eruptions over extremities, face and trunk, which were exudative and crusted at places. She had delayed milestones with growth failure and no pubertal features. She did not have any risk factors to be suspected for HIV. The lesions were refractory to treatment, so she was tested for HIV and she came out to be HIV positive. 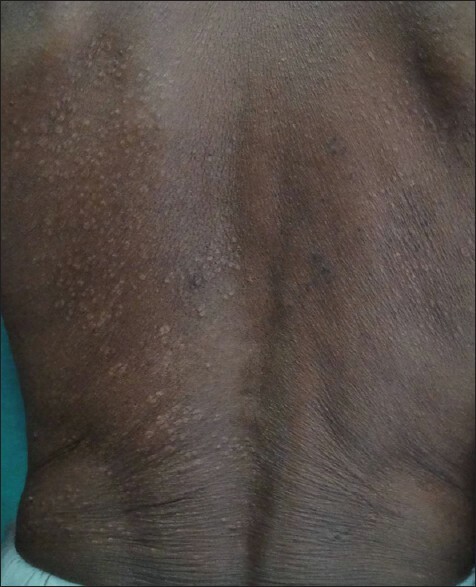 This case reports pruritic papular eruptions as presenting illness of HIV. Reiter's disease is characterized by the triad of peripheral arthritis, urethritis, and conjunctivitis. A 38-year-old male, who was on treatment with lithium for mania, presented to us with all features of this triad. He was previously diagnosed and treated as seronegative arthritis. However, his symptoms persisted despite therapy. His skin lesions regressed only once lithium was stopped. Lithium is known to exacerbate or precipitate a multitude of dermatological conditions. However, there is no previous reported association of lithium exacerbating preexisting Reiter's disease. We report this case as it is the first known association of its kind.